Practice this often until your "Love Bubble" becomes a permanent part of you. Take slow and steady deep breaths throughout the exercise. Continue visualizing every instruction until you feel it is complete. Continue saying/thinking: Thank you, I accept the LOVE Energy. Allow LOVE & LIGHT to fill you, cleansing and saturating every part of your being, overflowing to form a bubble which completely surrounds and protects you. Allow the LOVE & LIGHT to fill your Bubble, completely saturating every part of it. 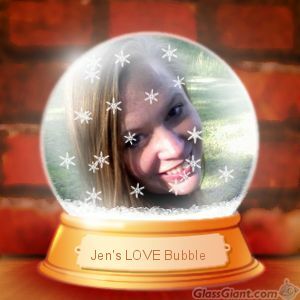 "Welcome to your Love Bubble... may LOVE cushion you Always!" ~ Jennifer Kruse, LMT CRMT www.JenniferKruse.com Click Here to Visit Jen's Blog!